Woodrow Wilson to historians: Stop lying about my record! The repeated assertions by President George W. Bush since 2002 that the national security of the United States depends on the spread of democratic government to the Middle East qualifies to make the American invasion of Iraq in 2003 a Wilsonian undertaking. Woodrow Wilson was NOT a neocon (though his predecessor and sometime opponent, Theodore Roosevelt, was). He was not an imperialist. The differences are subtle but critical; they have to do with how Wilson viewed America and now the neocons view it. And some people could stand to get a clue. Wilson’s America, the one I believe in, was exceptional and unique, but not because the American race or country deserved to be supreme. Rather, America was a vehicle for one of the greatest ideas in the history of the world: democracy. America was beautiful, but democracy was sublime. America only mattered, in Wilson’s view, insofar as it could assist in the spread of democracy to the world. This may sound like a neocon position, but it isn’t. Neocons switch the two priorities and declare America the supreme goal of the world, with democracy as its mechanism. The result is the narrowest kind of nationalism, blind support of American supremacy at whatever cost. This can include toppling popularly elected regimes like that of Hugo Chavez because they subvert American ends. Or banning the crack trade and thus putting the desires of American social conservatives over the need for Colombia’s elected government to defund murderous Marxist rebels. Or supporting an unelected dictator like Pervez Musharraf because he abets American hegemony. Or pulling out of international treaties like Kyoto and the International Criminal Court because they try to treat Americans equally. Or — most notably of all — de-funding the UN because we disagree with its priorities. When Wilson wanted to bring America into the League of Nations in 1919, it was the paleocons like Henry Cabot Lodge who brought down the idea and the President. Sure, nutty isolationists like Hiram Johnson and William Borah were its most vocal critics; but it was Lodge and his confreres who shot down the League of Nations, the bilateral security treaty with France, and the International Criminal Court — all because of a desire for worldwide American hegemony — and then lamely signed a no-more-war treaty with France (yeah, that big enemy of ours) nine years later. Woodrow Wilson would certainly recognize the neocons of today. He would recognize them as his ENEMIES, as the people who urged him to fight “the war to end all wars” only to thwart his dreams of perpetual peace. The people like Leonard Wood who wanted to go to war for the sake of national glory, like Roosevelt who wanted to gain American territory instead of letting people choose who governed them. Wilson’s endorsement of self-determination, a League of Nations, and the rest of the Fourteen Points was the exact OPPOSITE of these nincompoops. Wilson was willing to use force when necessary to advance greater worldwide aims (a key difference between him and Eugene Debs). But the force, and American hegemony itself, was always both expendable and unnecessary. 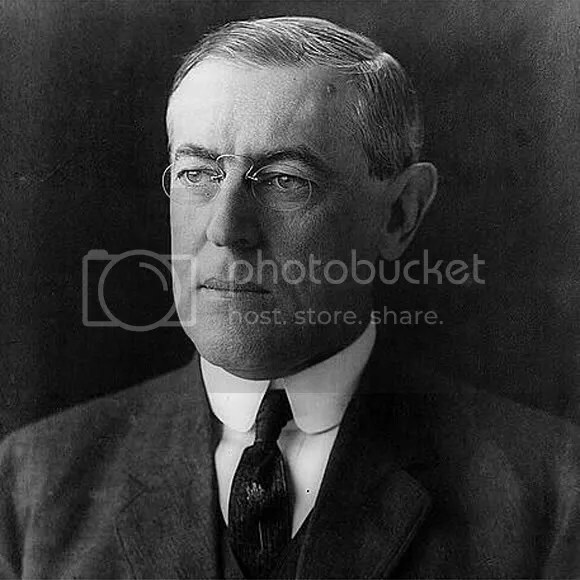 Wilson was quite happy to cede American power to try our soldiers, for instance, to the International Criminal Court if it would further the goal of international cooperation. So GUYS. Get a clue.. Heck, even this rightwinger gets it (though he still gleefully misuses the term Wilsonian, even after properly defining Wilson’s view of America as “‘a beacon of Liberty'”). So why can’t some of our country’s smartest scholars, like Gaddis and Joseph Nye, tell the difference between globalism and imperialism? It’s blindingly obvious — like the difference between the school guidance counselor who breaks up a fight for the common good, and the heat-packin’ Columbine shooters out for their own ends. This entry was posted on Saturday, October 6th, 2007 at 6:19 pm and is filed under Uncategorized. You can follow any responses to this entry through the RSS 2.0 feed. Responses are currently closed, but you can trackback from your own site.